Welcome to April, Always a busy month with the Typhoon & BBMF aircraft training to get ready for PDA and then on to a very busy year with the RAF 100 year display season. 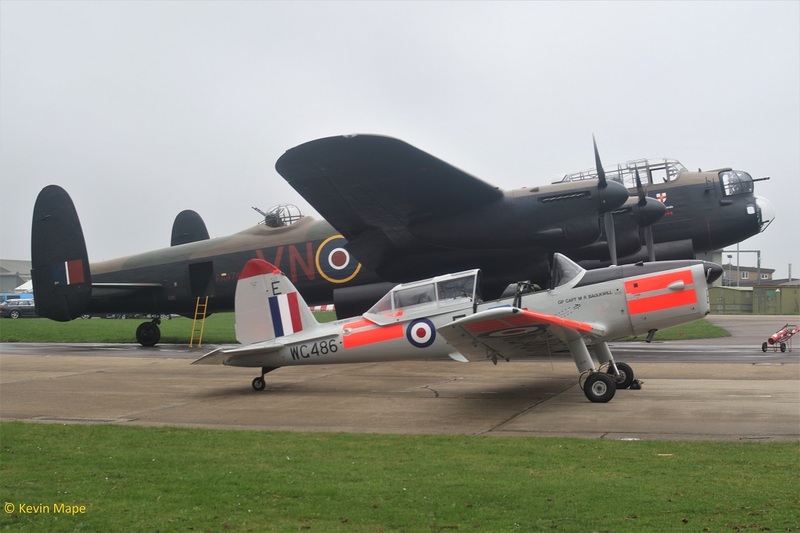 BBMF have test flown the Lancaster, Hurricane IIc PZ865 and SPitfire PR XIXe PS915. Dakota III ZA947 was noted engine running at the end of March. I am looking forward to seeing AB910 in it’s 92Sqn desert camo and TE311 in it’s new 133 (Polish) wing marks. 11-0061/352SOW/ CV-22B Osprey c/s “Knife 72” – overfly – 18-12 – South to north. 5th Thur Log thanks to Garf. G-MAJA/JA/Eastern/Jetstream 41 c/s “East flt 102” in “103” – out. ZK310/310 code only c/s 5 Bravo Alpha 37″ – QRA. PZ865/EG-S/BBMF/Hurricane IIc c/s “Hurricane 97” – Display. ZK36/366 code only c/s “Chaos 12” – aborted take off. G-MAJA/JA/Eastern/Jetstream 41 c/s “East flt 104” in “105” – out. PZ865/EG-S/BBMF/Hurricane IIc c/s “Hurricane 96” – Display. PZ865/EG-S/BBMF/Hurricane IIc c/s “Hurricane 94” – Display. ZK313/313 code only – Noted on the Wash pan. ZJ935/935/XI(F)Sqn c/s “Lossie 87” – Delivery to Lossiemouth. 9th Mon Log thanks to Susie,Mark & Garf. 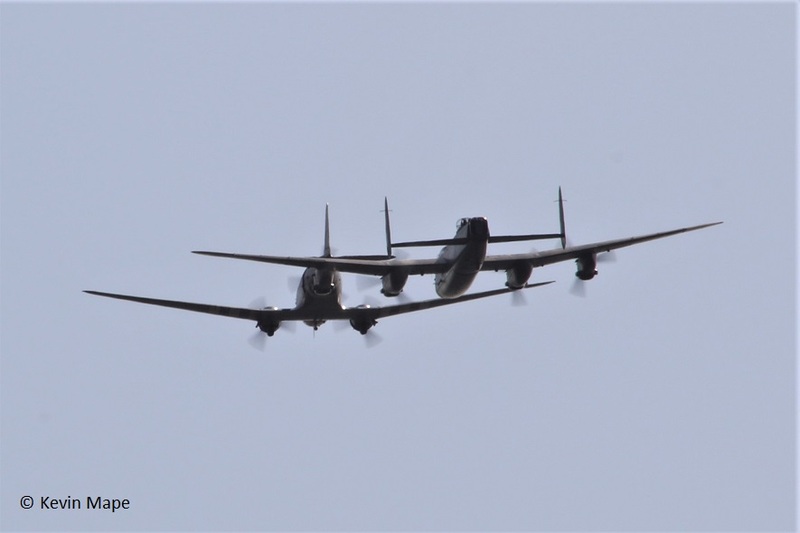 PA474/BBMF/Lancaster B1 c/s “Lancaster 95″ – ground abort due to low cloud base. Foxtrot – ZJ802/802 code only . 10th Tue Log thanks to Steve ,Val & Garf. ZK373/373 code only – noted on the wash pan. 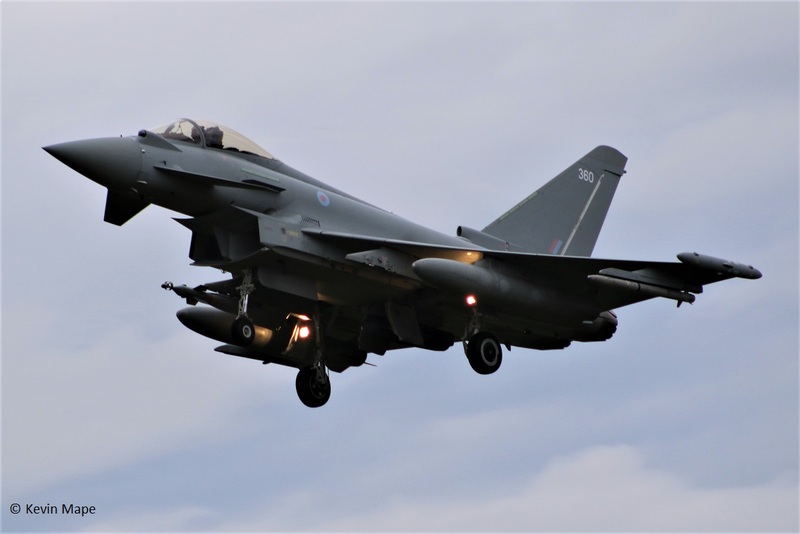 ZJ924/924 code only c/s “Typhoon 16” – delivery to Lossiemouth. ZK330/330 code only – towed from TMF to the ASP for engine runs. – returned to TMF later. ZK364/Unmarked c/s “Nightmare 52” -Diverted to RAF Valley due to weather at Coningsby..
ZK304/304 code only c/s “Rampage 12”-Diverted to RAF Valley due to weather at Coningsby..
ZJ803/803/29(R)Sqn c/s “Typhoon 16” – delivery from Lossiemouth.- first visit as 803. ZK360/Unmarked – Towed from TMF to Foxtrot dispersal. 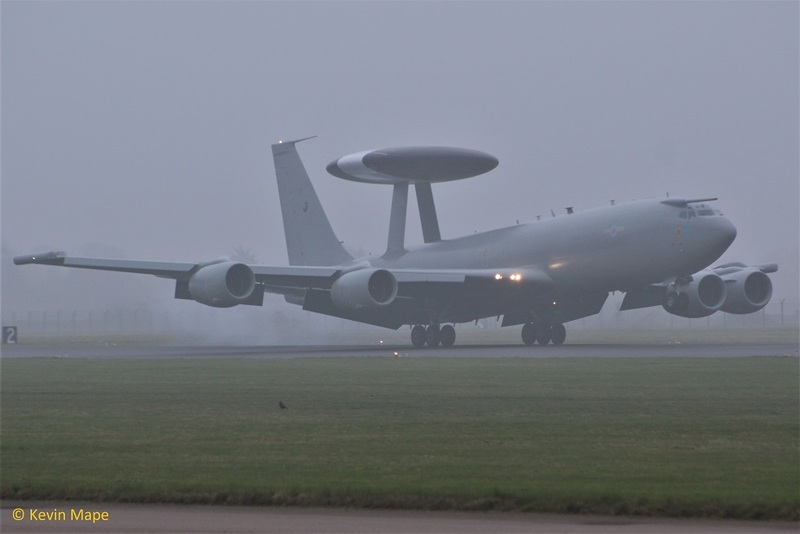 ZH106/06/8Sqn/E-3D Sentry c/s “NATO 21” – Parked on the ASP – Weather diversion. ASP – ZK318/RAF 100 tail. TMF – ZJ937/937 code only – noted outside. 11th Wed Log thanks to Garf. G-MAJA/JA/Eastern/Jetstream 41 c/s “East flt 105” in “106” – out. ZK313/313 – Towed from North side to HAS area. ZK360/um – Noted on the Wash pan. 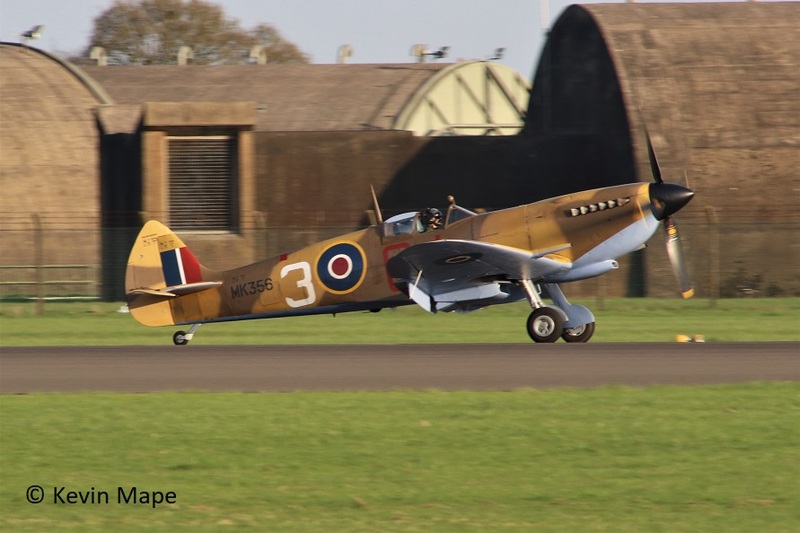 TE311/SZ-G/BBMF/Spitfire LF XVIe – Engine run. Please note any tactical movements to Cyprus or any other base will not appear on this web site for the safety of the aircrews. 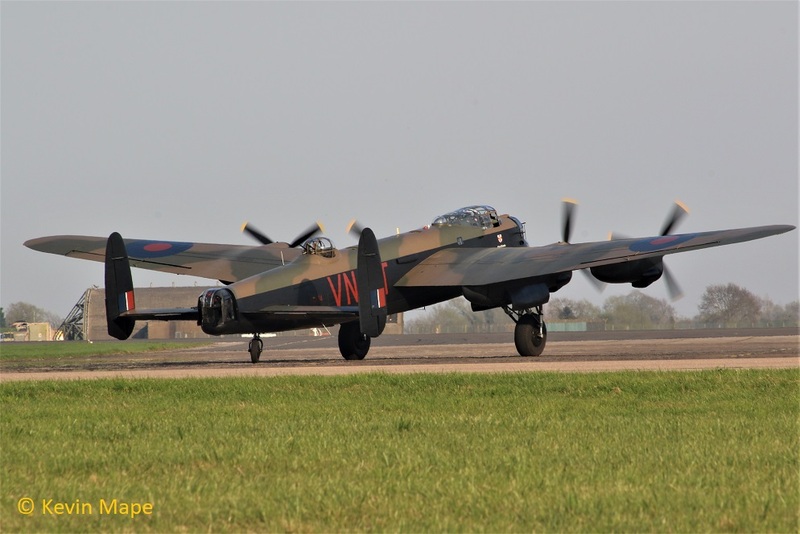 PA474/BBMF/Lancaster B1 – Engine runs . 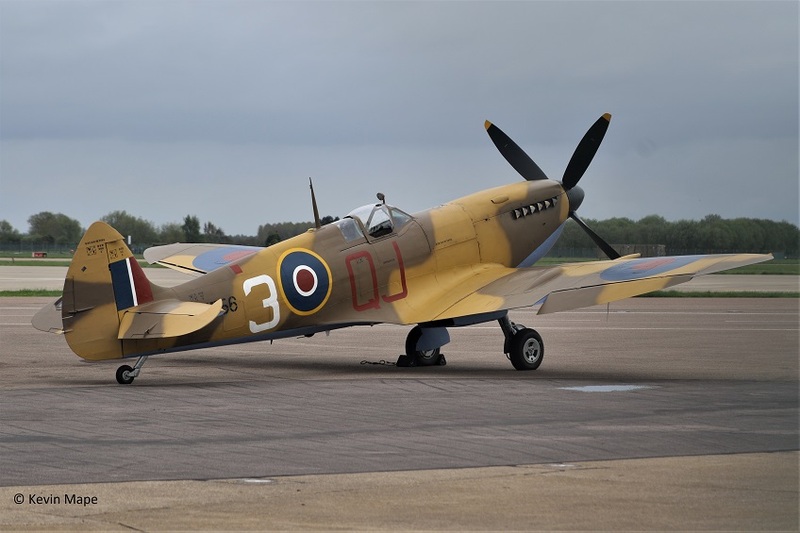 TE311/SZ-G/BBMF/Spitfire LFXVIe – Engine runs. ZK343/343/29(R)Sqn c/s “Typhoon 23” display. ZJ914/814/29(R)Sqn – Noted on the Wash pan. 16th Mon Log thanks to Garf,Mark & Susie. ZJ916/916 code only c/s Typhoon 23″ – Display. G-COBS/Whales/Da-42 Twin star c/s “Calibrator 324” – Parked on Sierra. ZA947/UK/BBMF/Dakota III c/s “Dakota 95” – Display. 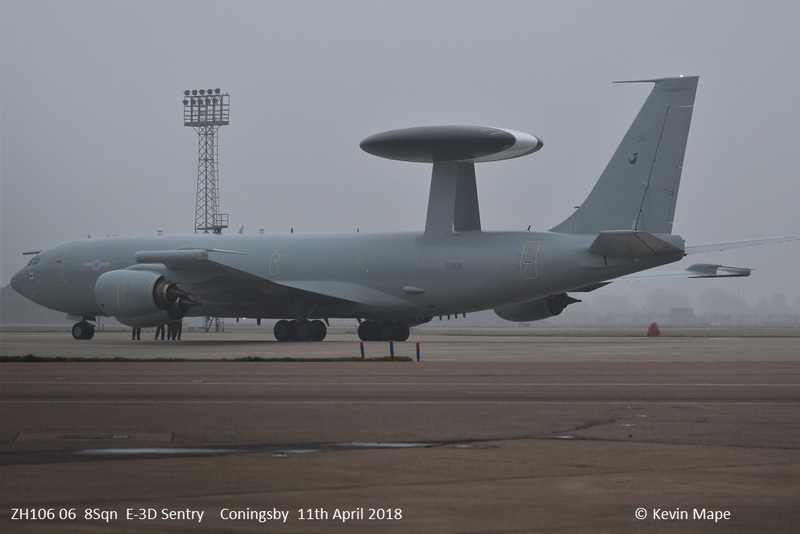 ZK430/Unmarked c/s “Tarnish 5” – Delivery from BAe Warton. 11-0057/352 SOG/CV-22B Osprey c/s “Knife 71” – overfly with :-. ZD849/110/code only /Tornado GR4 c/s “Voodoo 2” – Overshoot. G-MAJL/JL/Eastern/Jetstream 41 c/s “East Flt 104” in “105” out. ZK562/Chinook HC6 c/s “Vortex 397” – Overfly to Donna Nook. ZK343/343/29(R)Sqn c/s “Cobra 13” . ZJ807/807/29(R)Sqn c/s “Cobra 11” . ZK325/325 code only c/s “Havoc 22” . ZK343/343/29(R)Sqn c/s “Rampage 22” . ZK562/Chinook HC6 c/s “Vortex 397” – Parked on Sierra . Night flying Log thanks to Garf. 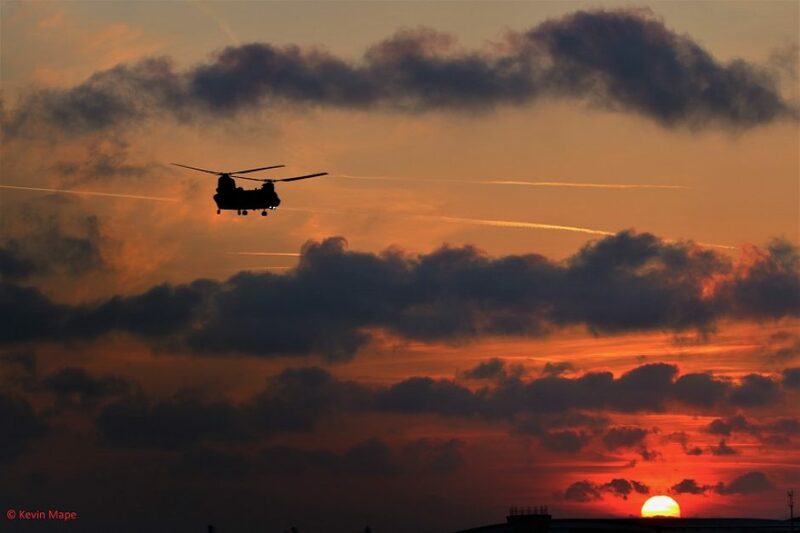 ZK562/Chinook HC6 c/s “Vortex 397” – To Donna Nook. ZK343/343/29(R)Sqn c/s “Cobra 31” . ZJ914/914 code only c/s “Cobra 32” . ZJ807/807/29(R)Sqn c/s “Triplex 42” . ZK304/304 code only “Nightmare 42”. ZK562/Chinook HC6 c/s “Vortex 397” – low overfly heading south. – 22-22pm. Echo -ZK316/Unmarked – ex full 6Sqn marks. 17th Tue Log thanks to Steve & Val. ZK343/343/29(R)Sqn c/s “Typhoon 23” – Display. ZJ946/946 code only – Towed from TMF to the ASP. ZK311/311 code only – Noted on the Wash pan. ZK357/Unmarked c/s “Razor 11” . ZK325/Unmarked c/s “Razor 12” . CV-22B Osprey – Overfly north to south 13-10pm. 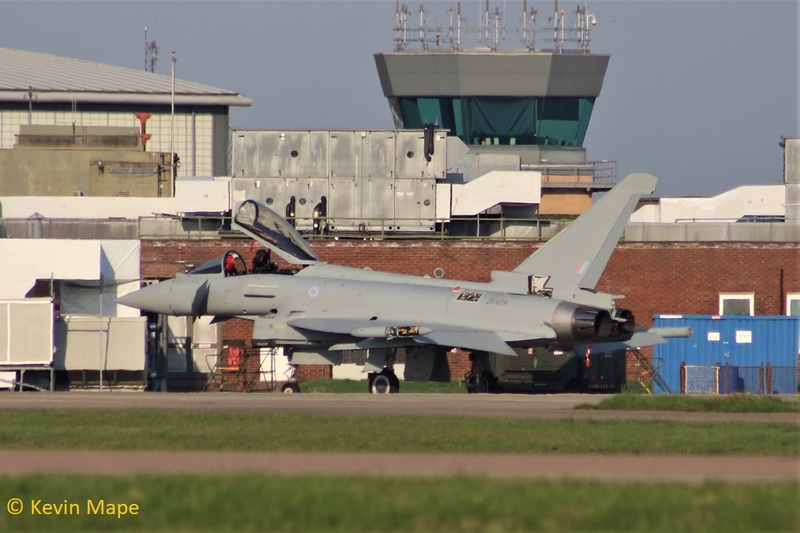 ZK343/343/29(R)Sqn c/s “Typhoon 23”- Display. .
ZJ946/946 code only – Towed back into TMF. ZK310/310 code only -QRA radio check. ZA543/036/Unmarked /Tornado GR4 c/s “Bulkhead 1” – Overshoot. ZK363/363 code only c/as “Triplex 21” – f/f in RAF service. ZK316/Unmarked c/s “Havoc 21” . ZJ916/916 code only c/s “Cobra 11” . ZK330/330 code only – Towed from TMF to Foxtrot. ZK363/363 code only c/s “Triplex 41” . ZK343/343/29(R)Sqn c/s “Triplex 42” . ZJ916/916 code only c/s “Cobra 31” . ZK360/360 code only c/s “Chaos 11” . XW220/Benson pool/ Puma HC 2 c/s “Vortex 283” – Parked on Sierra. 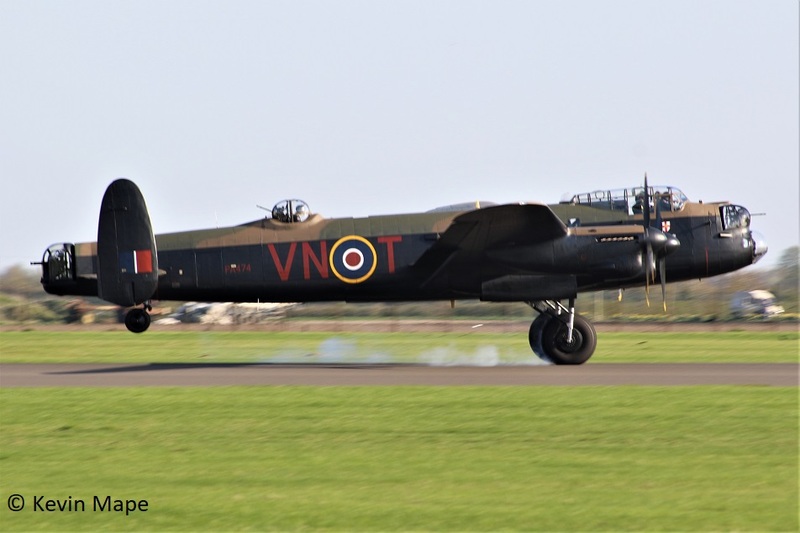 PA474/BBMF/Lancaster B1 c/s “Lancaster 95” – Display. 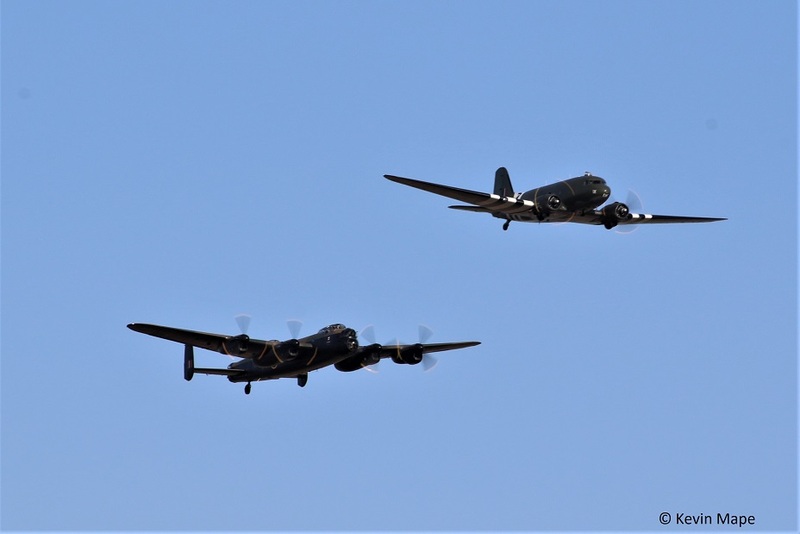 PA474/BBMF/Lancaster B1 c/s “Lancaster 95” – Rollers. Noted on the ASP – ZK429 / Unmarked. 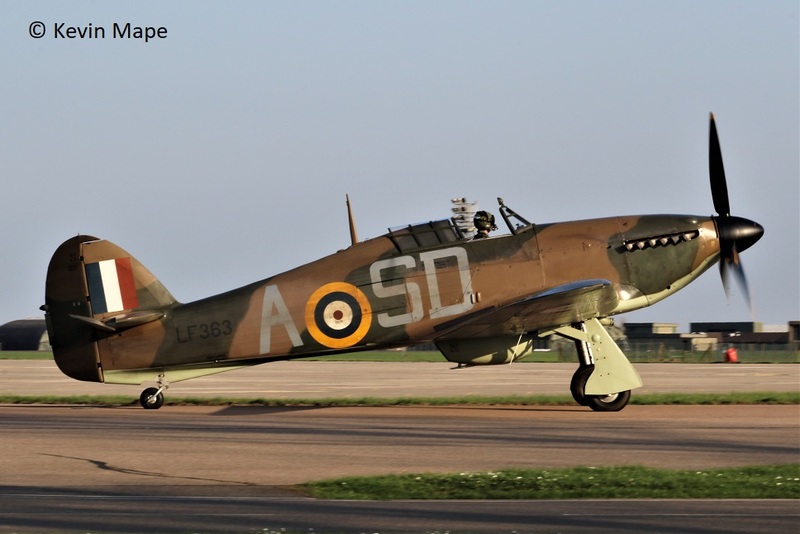 MK356/QJ-3 Desert camo/Spitfire LF IXe c/s “Spitfire 90” – First test flight of the season. ZK335/335/41(R)TES c/s “Ascot 9514” – Welcome home at last. 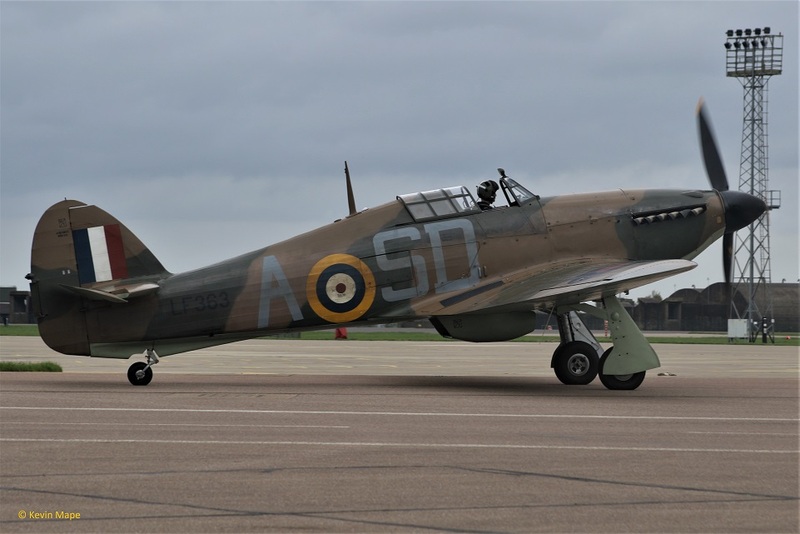 LF363/BBMF/Hurricane IIc c/s “Hurricane 92” – Test flight. ZM316/3FTS/Prefect T1 – Noted parked on Sierra. 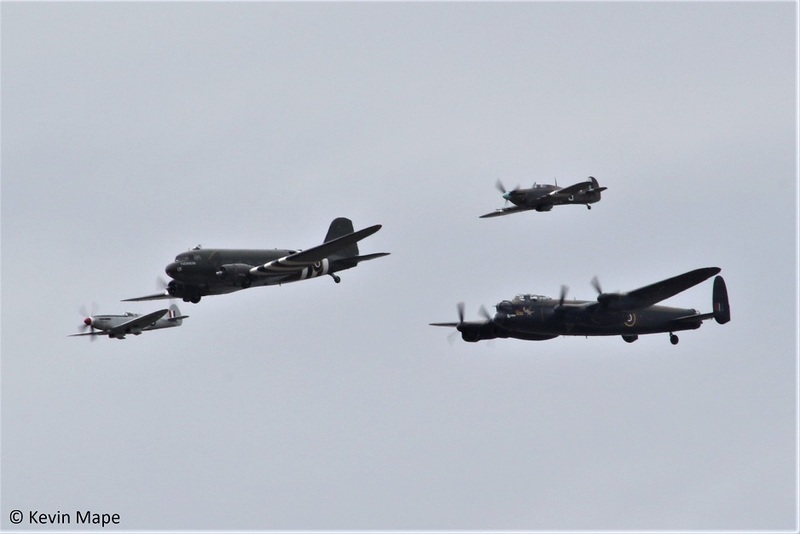 PA474/Lancaster B1, ZA947/UK/Dakota IIi, PS915/Spitfire PR XIXe and PZ865/EG-S/Hurricane IIc. ZJ220/4Reg/AH-64D Apache AH1 c/s “Army Air 441” – Overfly heading south west. ZK360/360 code only c/s “Chaos 22” – Paveway IV on one wing. 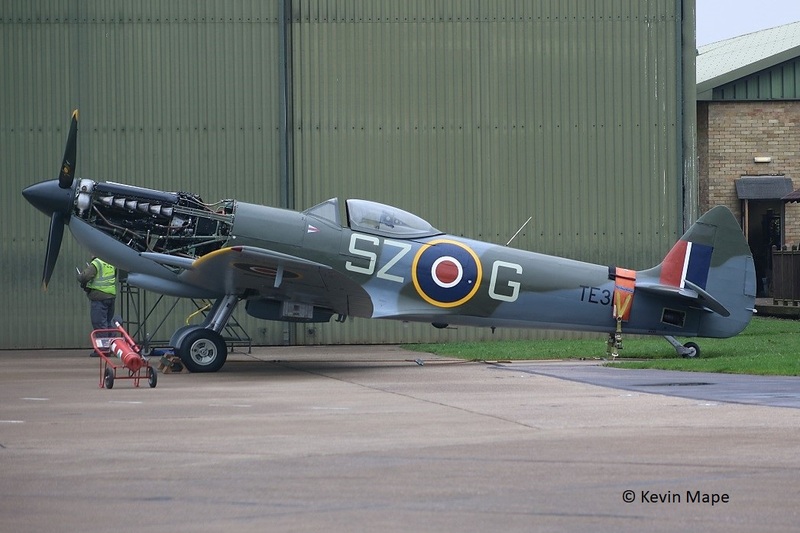 ZK318/RAF 100 tail – Engine runs on the ASP. ZK343/343/29(R)Sqn – Parked on the ASP. 24th Tue Log thanks to Steve & Val. ZK428/428 code only – Noted on the Wash pan. ZK325/325 code only – Towed from TMF to the APU tuner tunnel. ZK318/RAF 100 tail c/s “Typhoon 23” – PDA Display. PZ865/EG-S/BBMF/Hurricane IIc c/s “Hurricane 97” – PDA display. PA474/VN-T/AR-L/BBMF/Lancaster B1 c/s “Lancaster 98” – PDA display. ZK358/Unmarked c/s “Chaos 21” – Paveway IV’s. ZK304/357 code only c/s “Chaos 22” – Paveway IV’s. ZK331/331 code only c/s “Lossie 71” – Parked in Echo. G-FRAH/Cobham/Falcon 20EW c/s “Vader 61” – Parked on Sierra. G-FRAH/Cobham/Falcon 20EW c/s “Vader 61” – mission. – Parked on the ASP on return. ZK364/Unmarked c/s “Rampage 22” – Ground abort. 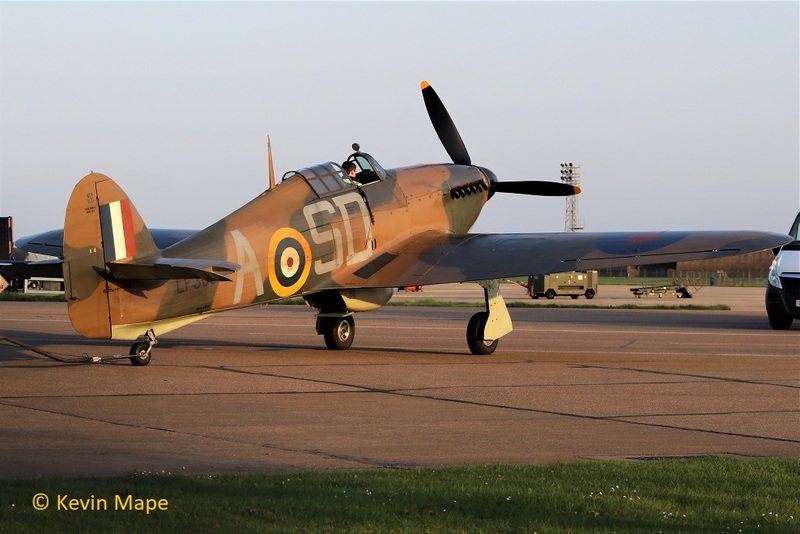 ZJ812/812/29(R)Sqn c/s “Gunfighter 62” – Returned on a emergency. ZK304/304 code only c/s “Chaos 21”- Paveway IV’s. ZK358/Unmarked c/s “Chaos 22”- Paveway IV’s. ASP – ZJ942/942 code only,ZK312/312 code only . ZK358/Unmarked c/s “Nightmare 22”- Paveway IV’s. ZJ183/AH-64D Apache c/s “Viper 2”. 25th Wed Log thanks To Susie,Dawn & Gary. ZA947/UK/BBMF/Dakota IIIc/s “Dakota 92” PDA display. ZJ946/946 code only – Engine runs on the ASP. 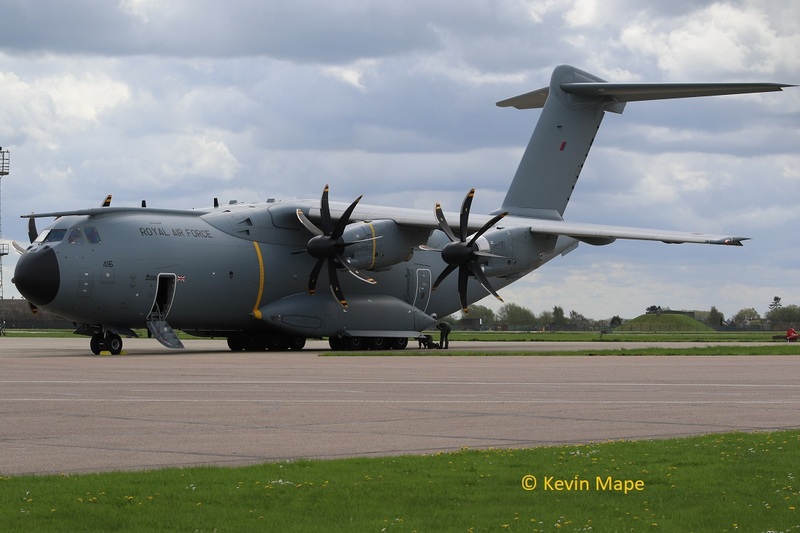 ZM416/416/24Sqn/A400M Atlas C1 c/s “Comet 451” – Parked on the ASP. 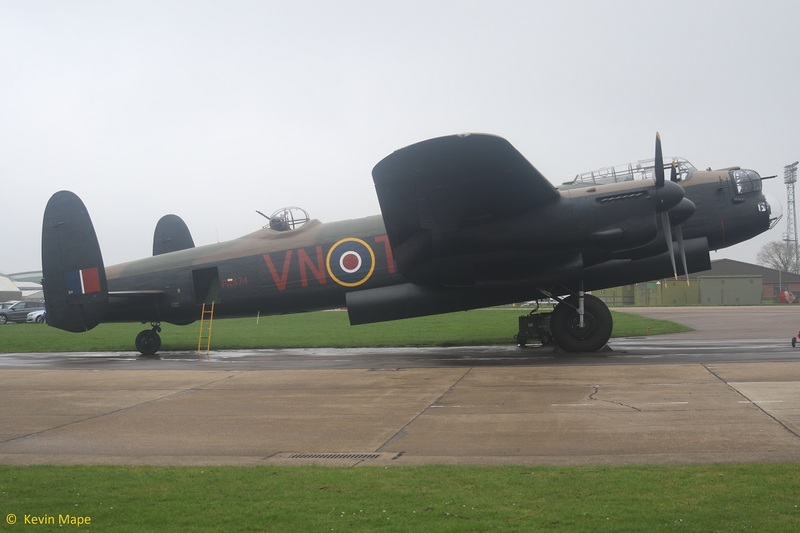 PA474/BBMF/Lancaster c/s “Memorial 1” – PDA display. Noted early evening Log thanks to Garf. ZK376/376/41(R)TES – Noted on the wash pan. ZK359/Unmarked c/s “Tarnish 29” – delivery from Warton. ZJ914/914 code only – radio check 18-21pm. Noted on the ASP at 17-10pm. ZK317/317 code only c/s “Lossie 54” – Delivery from Lossiemouth – Parked on the ASP. ZJ807/807/29(R)Sqn c/s “Lossie 54” – Delivery to Lossiemouth. G-MAJA/JA/Eastern/Jetstream c/s “East Flt 103” in & out. ZK427/427 code only c/s “Typhoon 29” f/f in RAF service. ASP – 29(R)Sqn – ZK363/363,ZJ928/928. 30th Mon Log thanks to Susie. AM High winds most of the day. G-MAJA/Eastern/Jetstream 41 c/s “East Flt 104” in “105” out. 29(R)Sqn c/s used : Triplex ,Cobra ,Warlord , Typhoon 29 – 51 , 100+ ,300+. ZK318 : 29Sqn bars – RAF 100 tail. ZK373 : 373 code only. 41(R)TES c/s used : Rebel , Apollo , Viking. ZK315 : 41Sqn 100 year special marks. 3(F)Sqn c/s used : Chaos , Esther , Nightmare, Rampage, Typhoon 02 – 10, 12- 27. XI(F)Sqn c/s used : Havoc, Razor, Tyrannt , Hellcat . Typhoon 11 , 60 – 82. 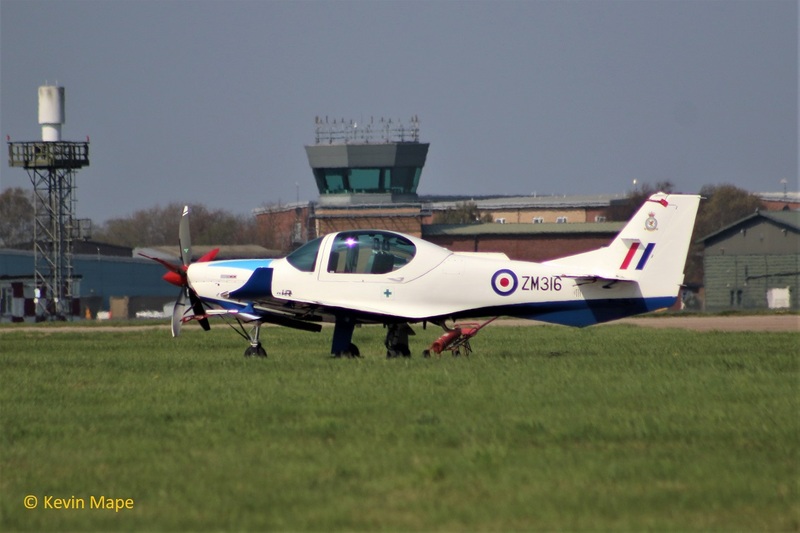 ZK316 : 316 : 6Sqn – Unmarked by 16/4/18. ZJ946 : 946 : Engine runs on the ASP 24/4/18. ZJ950 : 950 : Flying with 3(F)Sqn. ZK428 : 428 : Noted on the Wash pan 24/4/18. ZJ809 – Fuselage only – dump outside Hangar 2. South side – Stored in Foxtrot. ZK374 : u/m : stored waiting for TMF slot.